Cellulite is a condition where fat deposits beneath the skin are giving it a dimpled and lumpy appearance. It’s also known as orange peel syndrome, cottage cheese skin, and the mattress phenomenon. Also, every woman would face this condition in some phase of her life maybe when she reaches puberty or experiencing early motherhood or menopause. During these stages, they undergo many hormonal changes which when not taken care of may lead to the deposit of cellulite in various parts of their body like buttocks, thighs, and underarms. The main factors of cellulite are hormonal changes, or you may carry it in your genes, or by following improper diet and lifestyle. Whenever there are hormonal changes in specific phases of our lives, we need to take care of nutrients that our body would require or else it will lead to some or other kind of harms to our body. Hormones like estrogen, insulin, noradrenaline, thyroid, and prolactin are primary causes of cellulite process. You must have often heard doctors complaining about the imbalance of thyroid hormone in people who are suffering from cellulite. The very same syndrome could be passed on to you from your mother or father. One must have often noticed even if we follow a balanced diet we still have a tendency of growing cellulite like our parents and very same areas. It is because you are carrying in your genes. It can be avoided by taking proper diet combined with physical exercise. Often in our adolescence age, we end up eating junk food which may again result in the formation of cellulite in our body or when we lead a lazy no activity life that too has similar results. There are various things and precautions that we could take to get rid of this overgrown cellulite on our body. Some of them are as follows. Dry brushing is a method where you brush your body in circular motions without applying anything on your skin, just a dry brush with soft firm bristles. While you move the brush in a circular motion, you can start with your soft parts like armpits and cover your legs, stomach and then your buttocks and back. You can make it part of your daily routine, just ten minutes before you hit the shower, dry brush your entire body. People have reported the decrease in cellulite from the body parts by following it just for not more than a month. Dry brushing exfoliates your skin to remove dead skin and at the same time also allows the proper blood circulation on the surface of your skin which activates that area to burn legitimate stubborn fat beneath and grown new fresh layer every time. You can combine this with the application of coconut oil. Apply extra virgin coconut oil all over your body which provides it with essential moisturizer and then dries brush your skin. It recommended to bath with some warm water after this activity to maximise the results. Always make sure your skin is dry before you do dry brushing and always make movements from outside towards your heart and counterclockwise on your stomach. Dry brushing helps your body to lose all toxins by activating and opening the pores. It’s very useful to remove cellulite. It’s a great exfoliant to remove the dead skin cells. Just mix equal parts of olive oil, coffee ground, and brown sugar. While coffee grounds and brown sugar removes the dead skin cells, olive oil provides the required moisture to your body. The coffee ground is natural astringent which removes extra oil from your body thus this helps reduce red bumps and acne from your skin making it fair and flawless. Massage this magic scrub towards your lymphatic flow, i.e., from outwards towards your heart; this will improve the blood circulation beneath your skin and help reduce cellulite naturally. It also prevents water retention in your body which results in swelling of your skin. Use this scrub for ten minutes twice a week before going for a bath on dry skin to get quick results. Many people have reported that they start seeing results not more than four weeks of starting this therapy. Massaging is an essential part of home treatment or otherwise to start reduction of cellulite from your body. Cellulite is a non-active of the fat layer beneath your skin which needs to be worked out to get rid of, and there is no better method than to use a scrub. Simple oil massage would only work on the surface of your skin not beneath it. The scrub helps improve blood circulation beneath the skin and open pores, thus removing all toxins and dead skin giving way to fresh skin cells. Green is the natural source of antioxidants that work to reduce the action of free radicals to stop the aging process of your skin and expedites the healing process. Green tea should be consumed in small quantities after every meal to increase the metabolism of your body. It helps reduce fat content from residing in your body which results into cellulite. When your body would excrete all the extra fat content, there will not be any left to store and deposit in the form of cellulite. It is a no exercise, zero calorie treatment for losing weight. Cellulite is often formed due to unhealthy eating and low exercise. Green tea is one shot treatment for both the conditions. It helps increase the metabolism of your body without you having to work out. Green tea has multiple benefits like it promotes heart health, lower bad cholesterol, helps in weight loss, removes toxins from your body, help younger skin, helps remove acne, boosts your immune system, protects the liver, kidney, and lungs to function well. It’s a boon to protect your whole body. It stops the production of fat absorbing enzymes and catechins found in green tea also helps reduce insulin resistance. All these benefits of green tea give you a good reason to replace that morning cup of tea/coffee. Tomato is said to be a God food to keep you healthy and young due to its high content of anti-oxidants. It can be both used internally and externally to treat cellulite. Take two tomatoes and chop them. Put these chopped tomatoes into a glass of boiling water. Now add one tablespoon of sugar and half tablespoon of salt and cook it for good ten minutes. 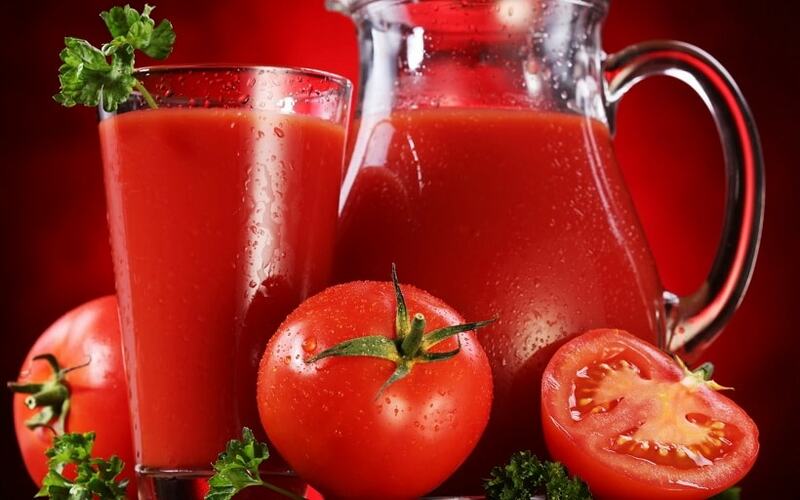 Now blend this mixture in a blender and sieve it to remove tomato pulps. Drink this high fiber content to help you reduce cellulite. You can make this drink part of your morning diet. It improves your digestive system and helps burns stubborn fat beneath your skin. To make a mask you can use a tomato and turn it into a paste, now mix some honey to this paste and apply it all over your body scrubbing gently. The antioxidants in tomato react with free radicals to give you healthy and cellulite free skin. Massage this mixture at least fifteen minutes twice in a week to have full effect. Tomatoes are high in lycopene which prevents the breakdown of collagen and thus helps avoid any fat from accumulating on your skin. With all above remedies, you should include a thirty-minute workout as part your daily regime to cut down cellulite. Be it a brisk walk in your nearby lawn or spending it on your jogger. Exercise keeps your heart healthy and your body in motion so that you spend the energy you have consumed. We all need a set count of calories in our body, and when we take more than that said number, it deposits in our body like fat. This deposition after an extended period appears into cellulite. Keep our body in motion is crucial even when you are thin. Cellulite does not happen to people with more fat cells but could occur in some parts of the body of thin people as well. A regular exercise regime would help you avoid it and if it happened then would help you get rid of it. Again, all above things will be nullified if you continue eating all those junk and processed food. One needs to eat a balanced nutritive diet. You diet defines a lot in your body. Our bodies are the composition of various nutrients and require each in different component and measure during different phases of life. There is different chemical reaction happening all over, and when we take some nutrient in excess and some in low quantity, then it may suffer from different problems. Your skin and body say it all. If you find something awkward in your skin, then you lack something. Like when you feel you have dry skin then you are not hydrating it well when you see too much acne, then you are not cleaning it well or are eating too much unhealthy food. It’s always recommended to contact a dietitian in important phases of life to know what special food should be part of your diet but otherwise, home cooked food never misses anything and is considered the healthiest when taken in right potions.